Item # 309582 Stash Points: 7,495 (?) This is the number of points you get in The Zumiez Stash for purchasing this item. Stash points are redeemable for exclusive rewards only available to Zumiez Stash members. To redeem your points check out the rewards catalog on thestash.zumiez.com. 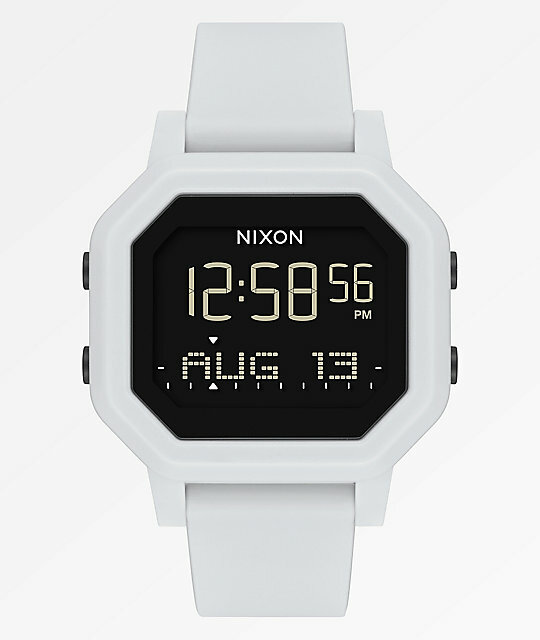 Show off your unique style, in and out of the water, thanks to the Siren White Digital Watch from Nixon. This stylish digital watch comes in a crisp white colorway, for an eye-catching design. With a multi-function digital module, this watch provides tide information, time of day, a calendar function, a customizable countdown timer, while the home screen can be set to display time and date, or time and tide. 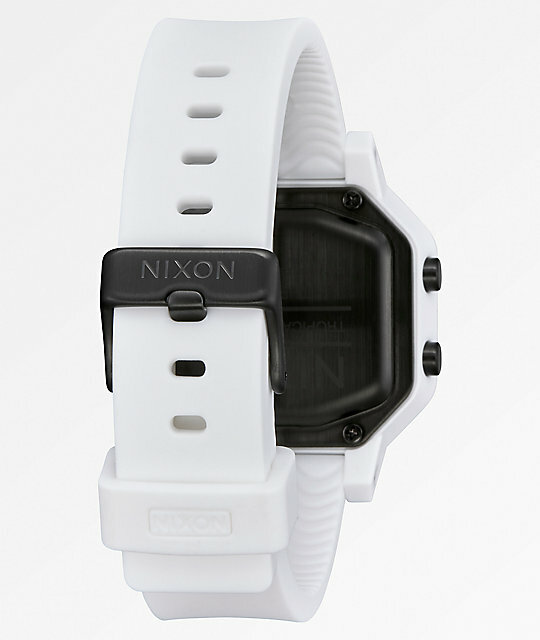 With a 18mm-16mm taper custom injection molded silicone band, patented locking looper, and stainless steel buckle, the Siren White Digital Watch from Nixon is the perfect timepiece and your newest surfing buddy. 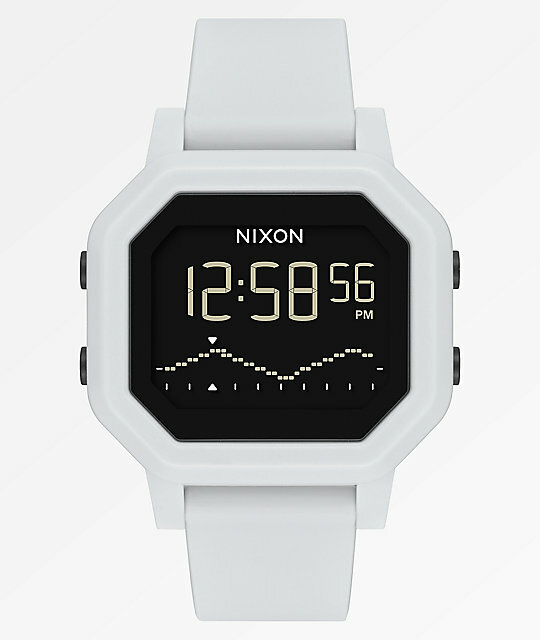 Siren White Digital Watch from Nixon. Movement: Digital module (home screen can be set to display time & tide or time & date). Functions: 12 or 24 hour time, day/date calendar, future tides, EL backlight, custom countdown timer & chronograph. Specs: 36 mm stainless steel case & 16 - 18 mm tapered band. Water Rating: 100 meter/10 ATM water resistance. Case: Light pink stainless steel pushers, screw down case back & screw bar lugs. Medium size to fit women's wrist. 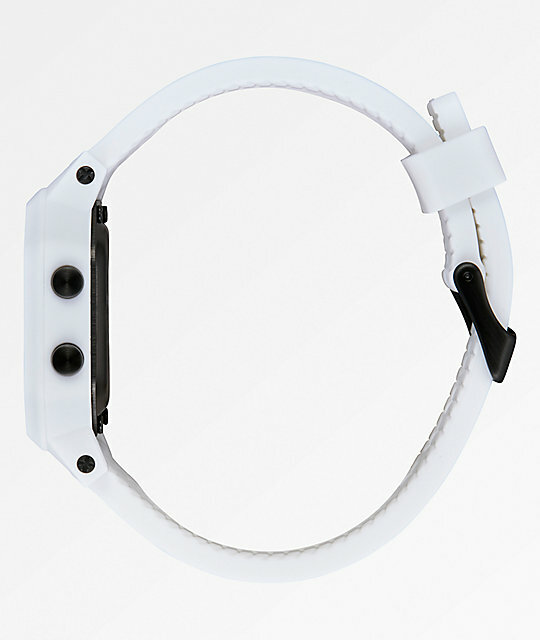 Band: Custom injection molded ultra-soft silicone tapered black band with patented locking looper.